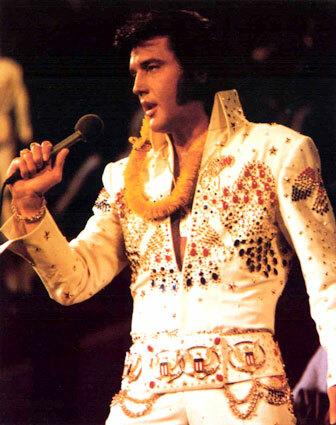 This page is dedicated to providing the site visitor with quality Elvis Presley biography fan`s survey results information from the site`s Elvis Presley Quiz, pictures and articles for your entertainment. The contents of this site is written by a fan for his fans. If you recently submitted your fan survey to the site, it will soon appear on its own website page like this. : I cannot pinpoint an exact time or date, it seems like he has always been there. : The fact that he had it all, a voice, a handsome face, such a dedication to his family and fans, his charity work; giving to others less fortunate, and the fact that he never forgot where he came from or the people around him. "My Message to Elvis": I would like to thank him for being my hero growing up and being there during those ackward teenage years, for giving so much of himself for his fans to the extent of giving up his privacy and being able to live a normal life, for many hours of beautiful music. : I would have to say Suspicious Minds for the song and Girl Happy is my favorite movie. : Suspicious Minds because I loved the melody and I loved his 70's music, and Girl Happy because it was full of him having fun, and I liked the soundtrack. : Without a doubt his mother and then Lisa Marie. : I had just finished dinner and was still at the dining room table when the opening news came on while my Dad was watching and the announcer said Elvis Presley died today. : Because his music is timeless, and there is a little something for everyone, he could sing country, gospel, r&b;, pop, he could do it all and he can appeal to anyone's taste. : No, keep up the good work to honor this great entertainer. TCB with TLC. Thank you for your taking part in our survey, and sharing your feelings and memories with us. Elvis was one fine human with extra good qualities. This southern boy, who felt different most of his growing years, had the world in his hands and treated it with respect giving to his fans, family and those less fortunate. Elvis was an extremely beautiful person, our hope is to honor not only him in the unforgettable beauty he give his fans but honor the man he was, he was a person before he was the King.